Submit Response is a weblog by Jack Mottram, a journalist who lives in Glasgow, Scotland. There are 1308 posts in the archives. You can subscribe to a feed. This post was made on and belongs in the music category. The previous post was Richard & Laura, and the next post is Today’s Links (13/09/04). 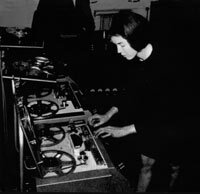 The subtitle for the forthcoming Tron Theatre/Reeling & Writhing co-production, Standing Wave: Delia Derbeyshire In The 60s, is interesting: the play is labelled as Theatre With Music - During, After And On The Net. I’ll write more on Delia and the new play closer to opening night on 7th October, but for now here’s a pointer to the latter component of the show, the website. There’s Delia-inspired music for download for free (though visitors are asked to consider making a donation to Breast Cancer Care) and the fruits of an ongoing open call for submissions from visitors to the site. I’ve not checked out the contributed music yet, but the commissioned stuff is mostly great, particularly Open Window Unit by Drew Mulholland (aka Mount Vernon Arts Lab and recently appointed to some sort of psychogeography postion at Glasgow University, fact fans). Posted at 9pm on 13/09/04 by Jack Mottram to the music category.